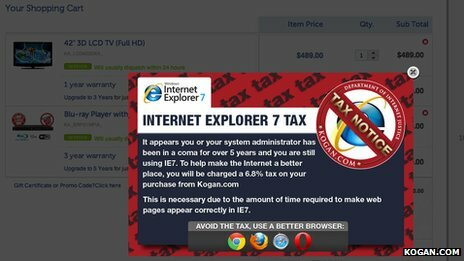 Stop using old web-browsers – time for a tax? BBC News – World’s first ‘tax’ on Microsoft’s Internet Explorer 7. Not even a hint of data recovery news in this post, but we liked it so much it was considered worthwhile to put up here. Can you think of any other taxes you would like to see added to antiquated or poorly developed technology products? Should you have to pay extra when you bring your PC in for repair and it is running a bloated Norton software package?